When Ransom Lawe, a recycler in the Pacific Northwest, discovers his wife is pregnant with their third—and therefore illegal child, he’s forced to choose between the government who proclaims a desire to save the planet and his hope for a place where his family can live in freedom. But with the Census Bureau Sentinels closing in on his wife and unborn child, Ransom’s choice will either save his family or tear them apart forever. 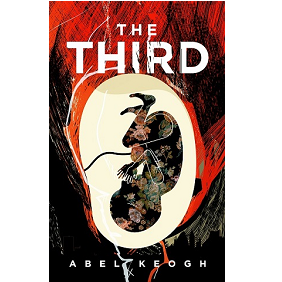 Abel Keogh offers a stark and haunting look at the not-to-distant future in this chilling novel. Crossing lines between good and evil, freedom and oppression, and political and environmental responsibility, The Third, is a gut-wrenching tale of intense loyalty and unconditional love. The tram's doors hissed open, flooding the platform with the heat and stench of a hundred human bodies packed tightly together. Standing on the platform, Ransom Lawe put a hand over his nose and mouth as the air washed over him. He took a step back, waiting for the passengers to exit. Only a gray-haired man wearing a patched, navy blue suit pushed his way toward the exit and off the tram. He held a worn leather briefcase above his head. Once the man's feet touched the platform, the waiting crowd shoved its way up the stairs and onto the tram. Ransom took a deep breath and surged forward with the others. Once on board, he used his mass to push toward the missing window opposite the door. Most of the tram's windows were rusted shut from years of neglect, and though closed windows were nice in the winter, at this time of year they turned the trams into cauldrons of heat. The second car on the tram Ransom caught to the Recycling Center each morning had a back window that had been broken for years, allowing the hot, dusty air to flow through the cabin and provide some relief. Ransom reached the window just as the bell above the door gave out a sharp ring and the door snapped shut. Setting his metal lunch bucket on the floor, he grabbed a handrail, and the tram surged forward. A hot breeze began drying the sweat from his face, and he took a deep breath of the dusty air, happy to have a momentary reprieve from the stench-filled car. Glancing around at the other passengers, he was bored to discover that most looked familiar. There was the man with the pock-marked face who wore the same bowtie every day and always got off on the 23rd Street stop. The woman with short hair and coffee-colored skin who always had her nose in a worn paperback. And the three employees wearing blue power company uniforms who stood in a tight circle at the back of the car, talking. They were people he saw every day on his commute to work, but he knew none of their names—strangers brought together by the thirty-minute ride into the heart of the city where it seemed almost everyone worked. No one made eye contact. Instead, they stared out the dirty windows or looked down at the floor in silence. The lucky ones sat on blue plastic benches that ringed the inside of the tram. Ransom looked down at the two women who sat in front of him. They wore identical work uniforms—black slacks and white blouses with the word Census Bureau embroidered across their left pockets in black lettering. Ransom recognized the narrow-faced older woman, her blouse yellowed around the collar from sweat and age, but he hadn't seen the other woman before. She seemed like a duplicate of her companion, only without the crow's feet and the permanently etched worry lines across her forehead. The younger woman's blouse was clean and pressed. Ransom figured she must be the older woman's daughter, and also a recent Census Bureau hire. There was no other way to account for the snow-white blouse. The tram arrived at the next stop, where the platform was packed. As the doors opened, a dozen people headed toward the exit and off the tram. Then the new passengers pushed forward. It was obvious there wasn't going to be enough room for everyone. For the better part of a minute, people tried to force their way onto the tram. Ransom could feel the crowd press against him. He held tight to the handrail, determined not to lose his spot by the window. The bell rang. The doors tried unsuccessfully to close. Over the crowd, Ransom could see three people holding the car's rear doors open as they fought for room. The bell rang a second time, and the tram began moving forward. Two of those trying to board let go as the tram picked up speed. The third man held on to the railing, probably hoping to make it to the next stop. But a hand from the woman directly in front of him shot out and caught him on the shoulder. The push caught him off guard, and he tumbled onto the platform as the doors banged shut. Ransom peered out the back window as the tram sped down the tracks. The man who had been pushed off leaned up on his elbows and thrust his middle finger at the departing car. Two dozen disappointed passengers still remained on the platform behind him. Half of them watched the tram speed away while the rest looked in the opposite direction, most likely hoping to catch sight of the next one. A baby's loud, piercing cry surprised Ransom. Looking toward the front of the car, he tried to catch a glimpse. At six foot five inches, he was taller than most of the passengers, but still couldn't manage to see the baby or mother. He did, however, notice that several riders near the front seemed to be looking toward the left corner of the tram. The woman and her child must have boarded early enough to land a seat. The tram pulled up to the next platform and stopped. Between each wail, Ransom could just make out the frantic hushes of the mother trying to quiet the child. It didn't help. The baby's cry became louder and more acute. Ransom felt bad for the mother. With the heat and smell of the car, he couldn't blame the baby, though he did wonder what the woman was thinking, bringing a child onto a packed morning tram. "I wish it was illegal to bring kids on these things," a female voice said. Ransom looked down at the bench in front of him, thinking that one of the two women was talking to him. "Why'd she even bring it?" the younger woman asked, looking at the older one. "Doesn't her building have a care center?" "From the way it's crying, it sounds like it wants attention. Maybe it's a third and she doesn't have enough time to care for it properly," the older woman guessed, her voice full of contempt. Ransom felt a flash of anger at the woman's comment, but didn't say anything. Instead, he bit his lower lip and stared out the window. He preferred not to hear more of their conversation, but they were sitting too close, and he couldn't just move to another part of the tram. The doors swung shut again, and the train lurched forward. The baby continued to howl. Ransom did his best to put the women and the baby out of his mind. He leaned forward into the dry air. The tram came to a sudden stop. The tightly packed passengers stumbled in one mass toward the front of the car. Ransom gripped the handrail tightly to avoid being thrown. As he looked around, he noticed that everyone seemed to be okay. He leaned his head out the window to see what was going on, his knees bumping those of the older woman as he did so. "Hey, watch it!" she barked. Ransom ignored her. Fifty yards ahead was the 16th Street station. A crowd of people stood on the platform, staring at the stopped tram. He turned and looked down the tracks. A tram heading the opposite direction was stopped about twenty yards down the line. That could mean only one thing: a power failure. He pulled his head back inside and checked the time. It was quarter to eight. He still had fifteen minutes to get to work. If he started walking now, he might make it on time. The infant's cry, which had come to an abrupt end when the tram stopped, started up again. "Open the doors!" a man shouted somewhere near the front of the car. His voice was loud and momentarily drowned out the baby's wails. "Be patient. The power will be back on in a minute," suggested a female voice from somewhere in the middle of the tram. "Shut up!" the man retorted. "Some of us have places to go." Two men who were pressed up against the middle doors turned and tried to pry them open. Things were quiet for a beat. Then the baby let out another scream. Ransom looked at the men struggling with the doors, hoping they'd open them soon. A bit of fresh air and more space was what everyone needed. "I don't care if it's sick," the man blustered. "I have a right to ride to work without your little parasite screaming in my ear." There was another pause, then something that sounded like the mother trying to hush her child. The baby continued to cry. "If you won't shut it up, then I will!" There was the sound of scuffling, followed by the cry of, "Give me back my baby!" Ransom looked to the front. A large, muscular arm held the infant high in the air by one of her legs. The baby looked about two months old. She had dark eyes, olive skin, and a large mat of brown hair that hung in loose strands toward the ground. She wore pink shorts. The bottom of her white T-shirt hung down to her neck, exposing her soft belly. He couldn't see the face of the person holding her, but the man's cruelty was obvious. The baby quieted for a moment, seemingly surprised to find herself upside down. Then her face turned crimson and another cry burst forth. A more delicate arm reached up and tried to grab the child, but it was quickly swatted away. The man with the deep voice chuckled. "A breeder like you needs to be taught some parenting skills, like how to rock it to sleep." The man swung the little girl back and forth by her leg. Ransom cringed as the baby's head just missed the car's front wall. "Give her back now!" the mother screamed. "I'm just rocking it to sleep," the man said. "As soon as it shuts up, you can have it." "If you don't give her back now, I'll kill you!" the woman screamed. Ransom felt a bead of sweat run down his back. He glanced over at the men who had been trying to open the door. They'd stopped working and were staring toward the front of the car. Just about everyone was trying to get a glimpse of the commotion, but no one made a move to step in. Helping out was simply asking for trouble, of course. Better to mind your own business and go on with your life. Ransom looked down at the lunch bucket between his feet. "Don't threaten me, breeder," the man snarled, "or I'll bash its head!" The man swung the baby far enough that her head lightly struck the wall. It was so quiet on the tram that the small thud echoed through the car. The baby's face puckered up, and she let out a piercing cry. The woman screamed. Once again, her arms reached for the child. The man raised his free hand and brought it down on the woman. There was the sickening sound of flesh meeting flesh. "Try that again, and I'll spill its brains all over the floor!" The man's voice rumbled through the car like thunder. Ransom found himself pushing through the crowd. He ignored the cries and cursing from the other passengers as he shoved them to the side. In seconds he stood across from the man, the baby, and the woman. For the first time, he got a good look at the mother. She was probably five-and-a-half feet tall, with an olive complexion like her daughter. Her black hair was pulled back into a ponytail, and she wore a tiny gold cross just above her small breasts. Her right eye was swollen and puffy, and blood ran from her nose onto a navy blue T-shirt. Her fists were clenched, and her eyes filled with anger. The man holding the baby had small, deep-set green eyes. His shaved head glistened with sweat, and the muscles in his arms and neck pulled at the sleeves and collar of his black shirt. He looked to be Ransom's size, even though Ransom had a good five inches of height on him. He wore black boots and black pants. Around his waist was a belt containing handcuffs, mace, and a nightstick. A silver shield with the Census Bureau logo imprinted on it was pinned to his front pocket. Ransom paused. Census Bureau Sentinels only had jurisdiction when it came to population crimes. Their main job was to round up women who were concealing an illegal pregnancy, or children for whom their parents didn't have a replacement credit. As a result, they had earned the nickname snatchers. They had the reputation of having little respect for the law when it suited their purposes, so their jurisdiction usually didn't stop them. They were commonly known for their strength, fierceness, and cruelty. They inspired enough fear that even the police rarely bothered to investigate complaints against them. When it came to sentinels, the unspoken rule was to leave them alone and hope they'd do you the same courtesy. The baby's continued screams drew Ransom's attention back to the child. Her face was bright red. Two steady streams of tears ran from her eyes and down her forehead to the floor. Another two feet forward and to his right, Ransom could at least make a grab for the child. He took a half step toward her when the deep voice of the snatcher reverberated through the car. "Move any closer and I'll drop the baby on its head." Ransom stopped and faced the sentinel. He stared at Ransom through his tiny green eyes. "Back up," the man barked. "This matter doesn't concern you." "Give the baby back." Ransom did his best to keep his voice flat and steady. The sentinel's eyes betrayed a faint element of surprise. He likely wasn't used to someone talking back to him. "If you know what's good for you, you'll mind your own business," he said, looking back at the baby as though the conversation was over. "Give the baby back to her mother," Ransom demanded, his voice rising. Now Ransom had the sentinel's full attention. His eyes went from Ransom's face to the Recycling Center logo on Ransom's breast pocket. "Are you kidding me? You're a just a recycler. Why don't you go pick up some trash?" Ransom ignored the taunt. "I'm not going to ask you again." He took a step toward the sentinel so there was less than three feet between them. Out of the corner of his eye, Ransom saw the mother move closer. The sentinel saw it, too. His eyes darted from the mother to Ransom, then back to the mother. He seemed to realize that he couldn't stop both Ransom and the baby's mother from grabbing the child. Without warning, the sentinel pushed the mother, dropped the baby, and lunged at Ransom. The woman's head made a dull thud as it smacked against the window. Ransom ducked under the sentinel's arm and managed to catch the infant just before her head hit the floor. The mother sat up and rubbed the back of her head. She looked at Ransom, then rose to her feet and grabbed the baby from his arms. She retreated to the corner of the tram, where she held the child close to her breast. Ransom stood and turned to face the sentinel, who had fallen into the crowd and lay atop three passengers. Everyone else was backing up, trying to get out of the way. The sentinel rose to his hands and knees and shook his head. He grabbed a handrail and pulled himself to his feet, turning to face Ransom. Then he caught Ransom unprepared, his swing connecting with the side of Ransom's jaw, despite his failed attempt at ducking. Ransom felt his mouth fill with the coppery taste of blood. His legs gave out from under him, and he found himself facedown on the tram's floor. Then there was a sharp kick to his side. The air rushed out of his lungs, and he curled up, fighting for breath. Two strong hands grabbed him by the shoulders and flipped him on his back. The sentinel looked down at him with a smirk on his face. A bead of sweat fell from his forehead and landed squarely on Ransom's chest. "I told you to mind your own business," the sentinel growled. "Maybe next time you'll listen." He raised his leg, positioning his boot over Ransom's face. Ransom instinctively raised his arms and waited for the blow. Through the spaces between his fingers, Ransom caught a flash of silver, then the sentinel swatting his neck as if bitten by a mosquito. Ransom lowered his hands and saw the sentinel staring at a small object between his fingers. It was about an inch long, half of its length in the form of a thin needle. The sentinel glanced in the direction of the woman and opened his mouth to say something, then suddenly grabbed the pole next to him for support. His body swayed from side to side before he fell to his knees. Eyes rolling to the back of his head, he fell to the floor, face-first, next to Ransom. It was absolutely quiet on the tram. Ransom pulled himself to his knees. He could feel his breath coming back to him. He spat blood out on the floor. His jaw hurt, and a few of his back teeth felt loose. He looked over at the woman, confused by what had just happened. Suddenly, the sounds of the men trying to open the doors started up again. Moments later, there was a hiss as the middle doors were forced open. A blast of fresh air rushed through the car. The passengers made for the exit as fast as they could. The woman picked a yellow sling from the floor and put it over her shoulder. A drop of blood fell from her nose to the fabric. She placed the baby in the sling and stepped over the body of the sentinel, heading for the exit. The woman turned and looked at him. "Thank you for saving my baby," she said. "One day I'll repay you." "What did you do to him?" Ransom asked, looking at the motionless body. She knelt next to the sentinel and pried open his hand, retrieving the silver object. She slid it into her pocket, then pulled herself to her feet and checked the baby, brushed the dust from her pants, and headed toward the door. "Who are you?" Ransom tried again. "He'll wake up soon. You should get going." "Wait," he called, but the woman had hurried down the steps of the tram. Ransom pulled himself to a standing position. His jaw and side throbbed with pain. He staggered to the tram's open doors and spotted the woman thirty yards down the street. She was walking fast, weaving her way in and out of the throngs of people. Ransom hurried down the stairs and started after her. He was still winded and stiff from the fight. Within twenty yards, he had to put his hands on his knees while he caught his breath. When he looked up again, she was gone. Then he heard a high-pitched police whistle. Three cops were running down the street toward the tram. The middle one had a silver whistle between his lips that he blew as he ran. Quickly, Ransom got in the back of a nearby line for a grocery store. Once the police ran past, he hurried down the street as fast as he could walk, anxious to put as much space between him and the tram as possible. It wasn't easy. He was still dazed and hurting, and the sidewalks were crowded with people going to work, groups of kids in their yellow-and-green uniforms hurrying to school, and people standing in line waiting for stores to open. To make faster progress, he stepped off the sidewalk and walked in the gutter. But even that path had obstacles. Donkey carts were parked in front of stores, their drivers unloading burlap bags filled with produce and supplies. There were piles of manure—some fresh, others days old—that had been swept to the gutter but not yet collected. Ransom ended up back on the sidewalk. As his distance from the tram increased, Ransom's adrenaline ebbed and was replaced by fear. He wondered if the sentinel would be able to give the police a good description of him. The man had seen his uniform and knew where he worked. If police showed up at the Recycling Center, it wouldn't be too hard to figure out who he was. It was a rarity for people to be much taller than six feet. As far as Ransom knew, he was the tallest employee at the center. He chastised himself for intervening in something that wasn't his business. The last thing he and his family needed was for him to miss work and spend a few weeks in jail. Money was tight enough as it was. What had he been thinking? A pack of stray dogs ran out into the street. The lead dog, a German shepherd with spots of fur missing from his body, looked at Ransom with sad brown eyes. Ransom reached down to the gutter and pretended to pick up a rock. Immediately, the pack of dogs turned and ran across the street. Ransom checked his watch. It was eight o'clock. He was late for work. Ignoring the pain in his side, Ransom picked up the pace and hurried the remaining eight blocks to the Recycling Center. Ransom entered the doors at fifteen past eight. Off to the right was a small public waiting room. Eight metal folding chairs lined the perimeter of the room, but they were unoccupied. Past the room was a small window where a red-headed receptionist was too busy looking at her fingernails to notice Ransom as he walked by. Beyond the receptionist was another door that was propped open. A bored-looking security guard sat on a chair next to the door with his arms folded across his chest. Ransom flashed his work ID card at the man. Ransom shook his head. “I’ll be fine.” He could get to the cargo bay even if the hallway was pitch-black. Straight back, then take the first right. The door was at the end of that hall. But it wouldn’t be dark—at least not during normal office hours. As he hurried down the hall, orange candlelight radiated from the open doors of offices on either side. The soft glow reminded Ransom of walking down an unlit road at twilight. Ransom glanced in some of the office windows and open doors as he passed. Most people were bent over their desks, reading or filling out paperwork. A few had phones pressed to their ears. A middle-aged man with a large white candle on his desk and a pencil over his ear waved at Ransom when he walked by. Ransom was in too much of a hurry to wave back. He turned right and stopped at the door at the end of the hall. A bright white light emanated from the crack at the bottom. Ransom opened the door and stepped into a large cargo bay. Sunshine streamed through dozens of skylights in the ceiling. Five recycling trucks, painted forest green, were parked by the far wall. The trucks were twenty feet long and had a twelve-by-twenty-foot cargo hold on the back. Two other trucks were backed up to a wall on the right. Their cargo holds were filled with wooden beams, chunks of concrete, and scrap metal. Next to the trucks stood half a dozen men. A few leaned against a large conveyor belt that took material from the trucks into the recycling machinery in the center of the building. With no power, there was no point in unloading the trucks. Suddenly there was a click, followed by a humming sound. The reverberation of clanking machinery emanated from the heart of the building as the power came back on. Four of the men ran to either side of the conveyor belt as it rattled to life, and the other two jumped into the back of the trucks and started unloading the material. Ransom headed to the row of gray lockers. He grabbed the work order taped to his door, read it, then shoved it in the front pocket of his jumpsuit. He pulled a small key from another pocket and opened the door, grabbing his canteen and tool box. Standing at a large, stainless steel sink next to the lockers, Ransom let the cold water run through his fingers. This was the only sink Ransom knew of that didn’t have a water meter attached. The meters automatically shut off the water after five seconds and were mandatory for all homes, businesses, and government offices. No one knew exactly why this sink didn’t have one, but rumors circulated that the meter was packed away in a supervisor’s office or had been “accidentally” put on the conveyor belt and sent with a load of material to be recycled. Whatever the reason, Ransom wasn’t about to complain. There was a rumbling sound as one of the cargo doors opened. In the mirror’s reflection, he saw the driver honk and wave. Ransom gave the driver, Dempsey, a half wave in return. He turned and looked at the clock over the door. Why was Dempsey driving the truck outside this early? He shook his head. He’d ask later. As he looked in the mirror, he saw that his face was flushed from the quick walk in warm morning air; beads of sweat ran from his close-cropped hair past green eyes and down his cheek. Dried blood covered the corners of his mouth. He touched the spot and smarted where the sentinel’s fist had connected with his mouth. Ransom stuck his head under the faucet, closing his eyes. The water washed the sweat from his face and reduced the throbbing in his jaw, but it did nothing to calm his fears. After a minute, he pulled his head from the tap. Water rained from his brown hair to his face and splattered on the concrete floor. He looked around for something he could use to dry off. All he could see was a grubby, blue rag on a hook by the side of the sink. He used his sleeve instead. “Hey, quit wasting water,” a voice hollered. Ransom turned and saw a young man staring at him incredulously. What was his name? Jared? Joseph? Jesse? Jesse, that was it. He had been hired two weeks earlier and was assigned to one of the recycling crews that worked Green Zone 4. In that short period of time, Jesse had garnered a reputation as an over-excited know-it-all. Ransom was glad Jesse wasn’t part of his crew. Ransom took a hard look at the kid. He turned the tap back on and held his canteen under the water. In a few moments, water was overflowing from the top. Ransom kept the canteen under the tap, letting the water cascade down the sides. Jesse angrily reached for the tap. Most days, Jesse’s attitude would have only inspired Ransom to harass the younger coworker. He might have poured his canteen onto the floor and joked about the lost life of a fish or something, just to get a reaction. But today was different. He was still uptight about the morning’s incident. Anger, fear, and adrenaline pumped through his body, needing an outlet. Jesse paused, his eyes studying every inch of Ransom’s face. He moved to shut off the tap anyway. Ransom dropped his canteen and grabbed Jesse’s right arm, twisted it behind his back, then squeezed the tendons between Jesse’s thumb and pointer finger as hard as he could. Jesse’s back arched in pain. He tried to wriggle free from Ransom’s grasp. Ransom squeezed harder. “You’re wasting water,” Jesse said through clenched teeth. He let go of Jesse and pushed him away. Jesse glared at Ransom, then headed for the closest green truck, rubbing his hand. The men near the conveyor belt had stopped to watch the commotion. “What are you looking at?” Ransom yelled. The men shook their heads and muttered amongst themselves before returning to their back-breaking labor. Ransom picked up his canteen from the floor and filled it again. He screwed on the lid and shut off the tap. “Looks like you ran a marathon,” Dempsey noted. “Tram lost power, so I had to walk in,’” Ransom said, looking in the side panel to make sure they had all their tools and equipment. Without a word, Ransom climbed into the passenger side and slammed the door. He needed to calm down before he talked with anyone. He heard Dempsey close the side panel of the truck before he climbed in the cab and got behind the wheel. Ransom pulled the work order from his pocket and handed it to Dempsey. As Dempsey read it, Ransom looked at him. Dempsey was finally aging. His burly build seemed slightly diminished, and the hair seemed more gray than black now, contrasting well with his chocolate-colored skin. He also had more heavy wrinkles under his brown eyes and across his forehead, which he blamed on the stress of being a father. Dempsey handed the work order back to Ransom. Dempsey pushed a button next to the steering wheel, and the dashboard lit up as the electric motor came to life. But then he tapped at the power dial under the glass, as though he thought the reading was wrong. Ransom looked over at the dashboard. The orange power dial hovered just above the halfway mark. “We’re only half full? How much driving did you do this morning?” Ransom asked. Dempsey put the truck in drive and honked the horn so the others in the cargo bay would know they were in motion. The truck moved toward the large bay doors on the north wall. The two men by the doors stood and pulled the chain as the truck approached and the bay doors slowly opened. Dempsey nodded to the men as he drove past. He guided the truck around the back of the building to the street. He then looked both ways before honking his horn and pulling the truck onto Edward Abbey Boulevard—or “the ’Vard,” as everyone called it. Ransom didn’t reply. He looked out at the city as they drove past. Dempsey was right. Odds were they’d show up to the house and find that anything of value had been stripped. As they drove through the streets, Ransom finally felt the anger and tension slowly ebbing from his body. Suddenly Dempsey slammed on the breaks to avoid hitting a teenager who walked into the road. Ransom’s hands were braced to stop himself from hitting the dashboard, and Dempsey laid on the horn and cursed. The teen stood in the middle of the road and looked at the truck for a beat before walking to the other side. “Stupid kids don’t know to look both ways when they cross the street anymore,” Dempsey groused. “I’ll take your word for it.” Ransom smiled. Dempsey put his foot on the throttle and continued down the ’Vard, honking his horn more frequently. Dempsey honked the truck’s horn, and Ransom watched as a lady reading the news board jumped in the air. He could remember car-filled streets, but the memories were few and hazy. The clearest was of him sitting in the backseat of his family’s minivan, looking out the window as his mom pulled into a parking lot filled with cars. Perhaps he remembered it so well because the summer sun had reflected off their windshields and reminded him of a sky filled with stars. Ransom let out a laugh, and out came the last of his anger and tension. He smiled the rest of the way to the security checkpoint. There was one other recycling truck in line when they reached the security checkpoint. Dempsey put the truck in park and turned off the electric engine. They watched the two guards do a security sweep of the first truck. The first guard walked around the truck with a mirror attached to a long pole to look under the bottom. The second guard waited while the back of the truck’s container opened on its hydraulic hinges. Once it was open, he looked into the back, then banged twice on the side. A moment later, the hydraulic hinges started to close. When the two were satisfied, a third guard came out of the shack and approached the driver. “Looks like we’re going to be here awhile,” Dempsey said. Ransom looked up just as the driver handed the guard his paperwork. The guard was a short, pudgy-faced man with a goatee and close-cropped black hair and notorious for taking a long time to examine paperwork. He guard took the clipboard and licked his lips. It looked like he was examining every word with the thoroughness of a secondary school English teacher. All he was missing, Ransom thought, was a fat red pencil. He walked to the back of the truck on Dempsey’s side where there was some shade. He leaned against the truck, his eyes tracing the razor wire atop the fifteen-foot-high fence that encircled the city. He followed the wire until it reached a guard tower about a half mile away. Ransom could just make out a guard slowly pacing in the tower. Ransom turned his attention to the line of twenty or so people waiting to leave the city. Based on the size of their backpacks, Ransom figured most of them were heading to the farming community of Cheney, a couple hours walk to the west. Two people near the front of the line, a man and a woman, carried large backpacks on their shoulders with sleeping bags attached to the top. Ransom wondered where their journey was taking them. Yakima, perhaps. Seattle. Maybe even Portland. Wherever they were going, they looked anxious to start. Ransom couldn’t blame them. It was getting hotter by the minute, and the longer they waited, the more time they’d have to spend walking in the heat of the day. The braying of a donkey brought Ransom out of his thoughts. A guard lifted the stop pole and waved the man with the donkey cart through the checkpoint. The driver wore a wide-brimmed hat and a long-sleeve shirt. The back of the cart held burlap bags filled with ears of corn. Ransom felt his mouth water at the sight of the green husks sticking out the top of the bag. The driver gave the reins a shake, and the donkey picked up speed. Ransom made a mental note to stop by the store near his apartment on the way home. He might as well see if some of the corn had made its way to their shelves. He thought about getting some food from his lunch pail when he realized he’d left it on the tram. Cursing under his breath for forgetting it, he knew there was no point stopping by the transportation department to see if anyone had turned it in. No doubt some enterprising person had already eaten the food and sold the bucket at the Station or planned on using it himself. Steel buckets like that were expensive to replace—if one could even find a replacement. He’d have to come up with another solution after he got home. He simply couldn’t carry an armful of food onto the tram every day. In the meantime, his carelessness meant he was going hungry for lunch. He leaned against the truck and closed his eyes. It was going to be a long day. The truck lurched forward. Ransom looked up and saw the guard waving Dempsey to the checkpoint. The other recycling truck was already making its way down the road, leaving a trail of dust in its wake. Ransom circled to the passenger side and climbed back into the cab. He handed the work order to Dempsey, who handed it to the guard. Then they sat in the cab for five hot minutes while the same short, pudgy guard examined it. Several times, Ransom was tempted to tell the guard to hurry, but he kept his mouth shut. Any comments simply meant the guard would take more time signing the paperwork. Ransom had waited in line for an hour once because the guard had overheard him make a snide remark to Dempsey about the delay. “Open the back of your truck,” the guard ordered. “Why? We’re empty,” Dempsey said. “Just open it, sir,” the guard replied. Dempsey pushed a button on the dashboard, and the whine of hydraulic hinges filled the air. A few moments later, someone pounded on the side of the truck, and Dempsey pushed the button to close the doors. The guard signed the paperwork and handed it to Dempsey. He handed Dempsey a piece of paper from his clipboard. Dempsey glanced at it, then passed it to Ransom. It was a grainy copy of a photograph of a pretty woman with big eyes and dark hair. The guard waved them through the checkpoint. Dempsey drove down the dirt road at the truck’s top speed—thirty-five miles an hour. Ten minutes later, Dempsey parked the truck on the brown, matted grass of a red brick bungalow. Ransom figured it had been built during the post-World War II housing boom that had filled up much of the land west of town. There was a detached garage on the rear of the property and a rusting swing set in the back yard. Ransom walked up to the house. There was a large, empty square where the front window had once been placed. He walked up the concrete stairs to the tiny porch. The front door had three small, rectangular windows that went down at an angle. The glass was missing and so was the doorknob. He pushed the door open, listened a moment, then headed inside. Dempsey followed close behind. They stood in the middle of what had been a living room. The carpet had been torn up and removed. Small pieces of padding were still stuck to the floor. The outlets were ripped from the wall. There were holes in the walls where the wiring had been pulled out. One gash went all the way to the ceiling, where a light fixture had once hung. Ransom headed down a short hall to the kitchen. As expected, the kitchen sink had been removed, along with all the piping, cabinets, and counter tops. The only thing that looked untouched was the linoleum-covered floor. The basement, it turned out, was just as bad. There were holes in the ceiling where the copper piping had been ripped out. In what had been a utility room, there were only dark squares where a washer and dryer had once stood. The salvageable remains were next to zero. If they were lucky, the wooden frame would be in good enough condition to be reused. But with the house being over a hundred years old, Ransom didn’t have high expectations. He stopped in what had once been a bedroom. The walls were painted pink with big brown polka dots. The color combination was not to his liking. Still, he stood in the middle of the room and wondered who had lived in the house over the last hundred years. He wondered whether the home had seemed small and cramped or large and spacious to its occupants. He felt a twinge of jealously. This home was easily twice as large as his apartment. It probably boasted eighteen hundred square feet. Granted, he had recycled homes twice this size, but still, he’d love to be able to give his boys their own rooms and paint the walls their favorite colors. Ransom headed up the stairs and out the back door to examine the rest of the property. His first stop was the detached garage. He opened two large, white, wooden doors and stepped inside. It was instantly twenty degrees hotter and smelled like dust. The garage was empty except for a pile of shriveled leaves and dust in one corner and faded oil stains on the cement. The drywall was still relatively intact, but it was yellowed from water stains in a few areas near the floor. To his surprise, there were power outlets on the far wall along two wooden shelves. Ransom found it odd that someone would take the effort to strip out the house but leave the garage untouched. True, there wasn’t much to take, but the few power outlets and wiring in the walls held some value. He headed to the back yard. Next to the swing set was a large cherry tree. The green leaves were wilting. Despite its large size, Ransom figured it wasn’t going to last long—at least not without regular care. Not that it mattered anyway—once the house was gone, someone would come and take the tree down too. Cherry trees weren’t native to this part of the Green Zone, so it would have to go. Ransom kicked at some dried cherry pits on the dead grass, then moved to the swing set. The metal frame was pockmarked with rust. The swing seats were cracked and bleached white from years of exposure to the sun. Ransom wondered why no one had bothered to remove the frame. It was heavy, and the metal alone would easily bring a month’s worth of wages if one could find the right buyer. He got down on his knees and pulled back the brown, foot-high grass that surrounded the base of the poles. The swing set was anchored in cement. It appeared that someone had tried to chisel it away but had given up. Ransom stood up and looked around the yard. It was about a quarter acre in size. He found his mind drifting back to his two boys and wondered how they’d enjoy having this much space to run around. The play area next to their apartment building was crowded with kids, and there was always a fight for the swings or other playground equipment. But if they lived in this house, his two boys would have their own place to play. He stood for a minute and imagined them running around the yard, chasing each other and playing on the swings. The thought of his boys made him smile. Dempsey’s voice brought Ransom out of his reverie. He turned and saw Dempsey standing at the back door with his tool box in his hand. Ransom watched Dempsey head into the garage. A moment later, he could hear the sounds of the drywall being pried back from the walls. He was glad they had found something of value. His family needed the extra income that the outlets and wiring would bring. Teya grimaced as Lia inserted a needle into her arm. She watched as the small vial filled with blood. Then the needle was removed, and a patch of cotton was taped to her arm to stop the bleeding. Teya pulled down the sleeve of her blouse and watched Lia cap the vial and affix a label with Teya’s name and ID number to it. Her eyes moved from the vial to Lia, then back to the vial. She fought the urge to take the small glass tube out of Lia’s hands and wash its contents down the drain, but such an action would be futile. All it would do was raise suspicion, and she’d eventually be forced to give another sample. Teya randomly selected a vial from the tray. She read out the patient’s name and ID number and inserted the vial into the top slot of the Incubus. She shut the lid and pushed a button. Exactly twenty seconds later, a buzzing sound came from the Incubus, and the red bulb next to the slot lit up. While the nurse wrote down the results, Teya dumped the blood down the drain and placed the vial in a bucket in the sink. One down, thirty to go, she thought as she placed another sample in the machine. While it was processing, Teya stared at her sample in the tray and thought of ways she could get Lia out of the lab for a minute. Sixty seconds was all she needed to swap the label on her vial with the label on another. She had done it for her last two tests. She could do it again. The Incubus buzzed, and the red light lit up. Lia yawned and recorded the results. Teya removed the vial and glanced at Lia to see if she was looking. She wasn’t. Teya let the vial slip from her fingers. Glass and blood spilled across the cement floor. Lia jumped backward to avoid the mess. Once Lia walked out the door, Teya quickly moved to the tray with the vials. She picked up two vials—one with her name on it. Noting the name on the other sample, Eloise Johnston, she carefully peeled back the label. She had to work slowly or the label would tear. While she worked, she counted to sixty in her head—the time she figured it would take Lia to return. Ten . . . eleven . . . twelve . . . thirteen . . .
Once the label was off, she placed it upside down on the counter and pulled back the label from her own vial. Thirty-three . . . thirty-four . . . thirty-five . . . Carefully, she switched the labels. Fifty-five . . . fifty-six . . . fifty-seven . . .
She let out a sigh and dropped both vials back in the tray. She jumped at the sound of her name, spinning around to see the director of the Paul Ehrlich Clinic standing in the doorway. Dr. Geoffrey Redgrave was a short man with a protruding belly and a receding hairline. He wore a ragged white lab coat that was several sizes too big, giving him the appearance of wearing flowing white robes. Teya’s heart was racing. The way Dr. Redgrave held the doorknob made her think he’d been standing there for a while. She stood speechless under his gaze, trying to think up a natural excuse for what she had done. Teya inwardly groaned. She usually looked forward to unexpected clinic-related trips to the Census Bureau. They were an excuse to get out of the small, cramped lab and outside for a couple of hours. Plus, she could stop by her sister’s office for a while and chat. But today, the Census Bureau was the last place she wanted to go. Talking her way out of the assignment wasn’t an option, however. Due to confidentiality laws, the report had to be delivered by the head of the clinic or the head lab technician. And if Dr. Redgrave couldn’t do it, the task fell to her. He looked over Teya’s shoulder at the vials. Teya followed his gaze, her heart skipping a beat. “We’ve got quite a few samples today,” Dr. Redgrave said. “I’m right here, Dr. Redgrave,” Lia said as she scooted around him with a rag, broom, and dustpan in her hands. She knelt down and began picking up pieces of glass with her fingers and tossing them in the garbage can. Dr. Redgrave looked at the mess on the floor as if seeing it for the first time. “You did test that before it broke, right?” he asked. Dr. Redgrave massaged his forehead with his fingers. “Good. Getting women back in here to have their blood drawn again is a headache.” He turned without another word, leaving the door to the laboratory ajar. While Lia soaked up the blood with a rag, Teya looked out in the hall. It was empty. Quietly closing the door, she leaned against it and fought back tears of relief. She’d be more careful next time—if there was a next time. Her pregnancy was a week or so away from entering the second trimester. She couldn’t hide it forever, especially where she worked. Twice a year, everyone at the clinic received training on how to tell if a woman was concealing a pregnancy. She had been careful not to wear larger or baggy clothes, even though her clothes felt tighter around her waist. And she felt sure Dr. Redgrave or someone at the clinic would have noticed her breasts enlarging. But no one had said anything. Teya returned to her stool, fighting the temptation to put her hand on her stomach by reminding herself that such an action was the number one sign that a woman was pregnant. She noticed that the needle Lia had used to draw her blood was still on the counter. She tossed it in the sink with the bucketful of others that needed to be cleaned. She let her body relax as Lia swept up the last of the glass, dumped it in the garbage can, rinsed the blood from the rag, and washed her hands thoroughly. She was glad she had enough seniority that she didn’t have to clean up the mess. Washing the blood-stained vials and used needles was bad enough. She always worried about getting poked and contracting some horrid disease. Sometimes she wished they used the throwaway supplies some of the older doctors wistfully talked about when the topic arose. It would be more convenient and sanitary, they would say, to throw away used medical supplies instead of washing and reusing them. Even if the doctors were right, using disposables was impossible since there were no landfills or incinerators in which to put the waste. And even if there were, the clinic didn’t have enough money to buy large amounts of medical supplies—let alone pay the carbon taxes that would be required to ship them from Texas or wherever they were made. Unless the laws were changed or someone came up with a better solution, they were stuck with the status quo. When Lia was done, she picked up the clipboard. “Ready?” she asked. Teya gave her a weak smile, then looked at her sample—the one with Eloise’s name on it. She couldn’t bring herself to test it, at least, not right away. Instead, she picked up a vial on the other end of the tray and placed it inside the Incubus. She shut the lid and pushed the button. While it was processing, she picked up her sample and held it between her fingers. The vial was warm from the fresh blood inside. She held it up to the light bulb that hung by a single, frayed wire from the ceiling. Tipping the vial back and forth, she watched the red liquid move from one end to the other. She wondered how Eloise would react once she received a call asking her to return for a second test. Teya had made that call often enough that she knew it didn’t matter how many times the person on the other end was told that the Incubi weren’t perfect and occasionally came back with false positives. All the patient would hear was that the clinic wanted to run another test. It was like telling someone they had cancer. It didn’t matter how curable it was or if the doctor had caught it early enough to be treated. At the word retest, everything else became white noise. The Incubus buzzed, bringing Teya out of her thoughts. The red light was on, another negative result. She removed the vial from the machine as Lia scribbled the information on the form. Then, taking a long, hard look at the vial that bore Eloise’s name, she placed it into the Incubus and pushed the button. After what seemed like an eternity, the Incubus buzzed. She lifted her head and saw that the green light was on. Teya didn’t reply as Lia checked the extra boxes on the form. She couldn’t open her mouth without confessing what she had just done. She quickly removed the vial and put it in the small container on the counter so it could be tested again. I’m so sorry, Eloise. I promise to make your next visit here as short as possible, Teya thought as she loaded the next sample. On her way out the door, Teya gave Eloise’s contact information to Nevaeh. The red-headed receptionist smiled in return. Of the two girls who took turns working the desk, scheduling appointments, and passing out birth control, Teya thought Nevaeh was the most sensitive. She was the best at telling women they needed to return to the clinic. She had a soft voice and kept a steady, unemotional tone when she talked on the phone. It was the kind of reassuring voice women needed on the other end of the line, even if they didn’t hear most of what she said. “One call today?” Nevaeh asked. “I’m out for the rest of the day,” Teya said as she headed toward the door, the report in her hand and her purse over her shoulder. Outside, the temperature was pushing one hundred degrees. Teya headed straight for the tram stop a block away. Halfway there, she saw the tram pull up. She debated whether or not to run to catch it but decided that sprinting for a tram wouldn’t be good for the baby. Another train would be along in about fifteen or twenty minutes. She could wait. Since she’d left work early, she might as well enjoy the time off. A man sprinted past her. She watched him wave to the conductor to hold the doors. The conductor smiled then shut the doors just as the man made it to the platform. The man banged on one of the widows, startling the handful of passengers inside, but the tram picked up speed and was gone. He shook his fist before wandering over to one of the benches, where he sat down and wiped the sweat from his forehead. Teya arrived at the platform a few minutes later. A paper carrier brushed by and hurried to the news board. Teya took her to be about sixteen. The girl wore a faded black baseball cap with the logo of the local paper on it and carried a bucket under one arm and a metal tube under the other. Teya watched the paper carrier set both items on the ground before removing the lid from the bucket and tearing down the morning’s newspaper from the news board. She swung a backpack off her back and placed the discarded paper inside. Then she took a brush from her back pocket and dipped it into the bucket to spread glue in a z-like pattern over the news board. Finally, she pulled a large sheet of newsprint from the metal tube and pressed it against the board. “It’s the evening edition,” the girl said to Teya as she hurried away. Teya took a minute to skim through the paper. There was a story of the city council’s debate over whether or not to reduce the meat and milk rations this winter, how the triple-digit temperatures and water usage were affecting the city’s wells, and the latest updates on Sunday’s New Earth Day celebration. Then a headline in the left corner of the paper caught her attention. Woman thought to be pregnant with fourth. Family also missing. Teya looked around the platform before continuing to read. The man who had missed the tram was still sitting on the bench, resting his chin on one of his hands. Three others stood on the far end of the platform in the sliver of shade offered by a community message board. Satisfied that no one was paying attention to her, she bent down to read the article. A woman believed to be pregnant with her fourth child is missing, along with her husband and three children. According to Census Bureau reports, Amber River, 34, failed to appear for a mandatory pregnancy retest at the Rachel Carson Women’s Clinic yesterday morning. After repeated attempts by the clinic to contact her, Census Bureau Sentinels were dispatched to her apartment and found it uninhabited. River had received a first positive test two days earlier. Census Bureau spokesperson Thomas Ramirez declined to comment, citing the ongoing investigation when asked whether or not River or her family might have fled with a terrorist organization. He did, however, mention that steps were being taken to ramp up border enforcement to make sure River and her family couldn’t leave the city. According to Census Bureau records, Matthew and Amber River are the parents of three children, Hope, Robert, and Adela, who range in age from two to six. The records show the River’s bought a credit for their third child from Amber’s sister almost three years ago. No other credits were listed in their name. According to Mary LaFeur, a counselor who specializes in mental health assessments for women who want more than two children, women faced with an unplanned pregnancy often find themselves in an emotionally vulnerable state. Last year, 157 people were arrested for population crimes. Nearly three-fourths of them were women pregnant with children for whom they didn’t have credits. The others were husbands or boyfriends who aided the women in concealing their pregnancies. If anyone knows the whereabouts of Matthew or Amber River, or their children, they are encouraged to contact the Census Bureau immediately. The article was accompanied by a black-and-white photo of Amber. She had wide, innocent eyes and a large smile. Her dark hair fell just past her shoulders. Teya knew it was the kind of face that would make most men stop and turn if they were to pass her on the street. Teya’s stomach growled, bringing her out of her thoughts. She walked to the edge of the platform and looked for a tram. The next tram appeared to be three stops down—at least another ten minutes away. She sat on one of the empty cement benches, but the heat burned the backs of her legs even through her slacks. She moved to the partial shade offered by the news board. Inside her purse were a few salt crackers she had wrapped in a napkin for times like this. Chewing slowly, she looked around. Across the street, a donkey cart stopped in front of the grocery store. The driver grabbed a few bags from the cart and headed inside. Teya made a mental note to stop at the store on her way back in case there was some fresh food they could have with dinner. She wiped a bead of sweat from her brow and wondered if the baby inside could feel the summer heat. Teya knew she was running out of time. She thought about the conversation she desperately needed to have with Ransom. Although he loved the two boys they already had, he wasn’t going to be happy when she told him about the pregnancy because it would put their family and jobs in danger. They’d always had an open, trusting relationship, so when he learned she had kept this information from him for nearly three months, he was going to be even more upset. She thought of different ways to tell him about the pregnancy, changing what she’d say and trying to guess how he’d react. She just hoped that when she finally had the courage to tell him, instead of becoming angry, Ransom would hold her in his arms and tell her that everything would work out. The tram pulled up to the platform. It wasn’t any cooler inside. She looked around the car and took a seat near the door. There were only a dozen or so people on board. Most of them were fanning themselves with pieces of cardboard or folded-up paper. Teya looked inside her purse but didn’t have anything she could use. She’d just have to deal with the heat. Twenty minutes later, the tram stopped in front of the Census Bureau. Teya exited and stared at the five-story, black glass structure. She hesitated before entering the building. Get in, then get out, she thought. You’ll be inside less than five minutes. As Teya walked through the revolving doors, she was met with a blast of cold air. She stopped just inside and closed her eyes, taking in the welcome change in temperature. The Census Bureau was the only building in the city with an air-conditioning waiver from the Sustainably Agency. During the summer, the inside of the Census Bureau was kept at a constant seventy-five degrees. She took a long drink at a water fountain near the door and headed toward the bank of teller windows on the left wall. Teya had always thought the main floor of the Census Bureau to be a little over-grand. The large lobby extended one hundred feet from the door. On either side were ten teller windows, and between them were rows of wooden benches where people sat waiting for their number to be called. It seemed especially silly to have so many windows when only half were regularly occupied. A third of the benches were filled with bored-looking people holding numbers in their hands. Fortunately for Teya, she didn’t have to take a number. Instead, she walked straight to the window with the word statistics over it. She pulled the clinic’s test results from her purse and slid the paper to a middle-aged clerk with black hair and a yellowed collar. The woman quickly looked over the paperwork and, when satisfied everything had been filled out correctly, handed Teya a receipt to sign. Teya signed the paper and slid it back to the clerk. The clerk tore a yellow copy from the back of the receipt and handed it to Teya, who put it in her purse. She turned to leave and saw a sentinel standing directly behind her. Teya froze. The sentinel was at least a foot taller than she was. “Are you Teya Lawe?” he asked. He motioned to a lone door along the far wall behind the security checkpoint. Suddenly Teya felt hot. Maybe Dr. Redgrave had seen her switch the tests, realized she was pregnant, and used his excuse of leaving to get her to the Census Bureau. Maybe he called ahead and told them to arrest her. She glanced over at the main doors and thought about running but decided against it. Running wouldn’t solve anything. She took a long look at the guard then headed for the elevators—well aware that every eye in the lobby was following her. She passed through a metal detector, and a sentinel patted her down. Afterward, he handed her a safety pin and a yellow pass with the word guest printed in big, black letters. This wasn’t what she had expected. “Put this on your blouse. Make sure it’s visible at all times,” he said in a bored monotone. Teya’s head was buzzing. She clipped the pass to her breast pocket and followed the sentinel past the security checkpoint to the elevator. The sentinel held the elevator’s door open for her. She stepped inside, and he shut the door behind them. Teya’s heart pounded in her chest all the way to the fifth floor.